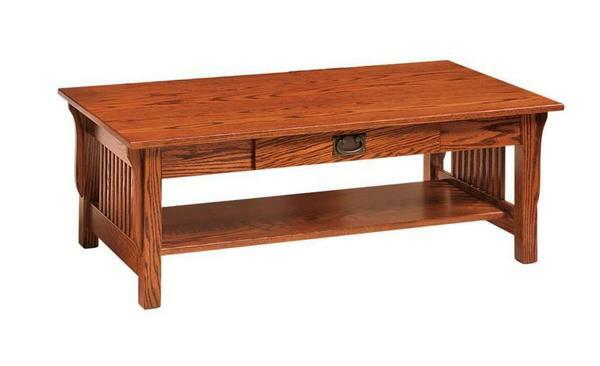 Some things are classic for a reason - and this Leah coffee table is a perfect example. With a time-honored Mission look that adds irresistible class to any space, the Leah brings long decades of beauty and stability to the home. This piece is defined as much by its intricate side slats as it is by its handcrafted solid wood construction, with these two key elements working together to create a coffee table that truly offers as much in style as it does in substance. Every Leah is built exclusively to order in a traditional Amish woodshop in the northern United States. This traditional process gives them ample opportunity to accommodate just about any custom request, including changes to dimensions, style, and features. If you'd like to talk with us about starting a custom order, or if you have any questions at all, please don't hesitate to get in touch by phone or by email at any time. The bookcase is the perfect compliment to the Amish Leah tables we purchased. It is roomy enough to hold the books and collectibles that were formerly contained on two book shelves, yet the size does not overpower the space we have for it.